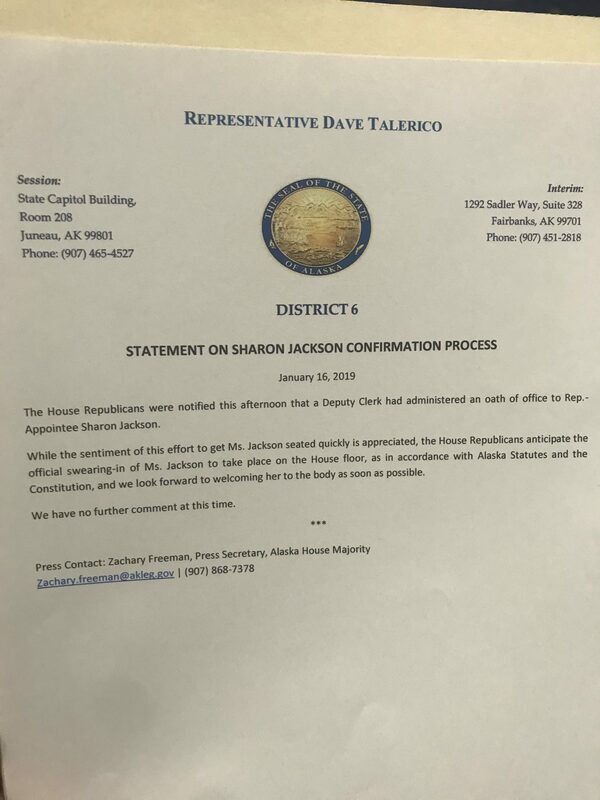 This all stems from some chaos on the House floor yesterday as Lieutenant Governor Kevin Meyer attempted to transmit a message from Governor Michael J. Dunleavy directly to House Republicans to confirm Sharon Jackson. Representative Chris Tuck (D – Anchorage) objected, saying Meyer did not have the authority to do this. This article explains that situation, Things get loose in the House as Republicans try controversial maneuver. Representative Gabrielle LeDoux (R – Anchorage) told me, “It’s the most bizarre thing I’ve ever seen.” Word around the Capitol is the House was close to making a deal to get a Speaker pro tempore selected, which would allow Jackson to be confirmed and the seated. I tried to get in touch with multiple members of the Republican caucus for a comment on the situation but was not able to reach anyone. I will update the article if I get a comment. Update: Here is the statement House Republicans issued after the bizarre event. I went over to the Court House and was told anyone can have a representative from the Court notarize or witness a signature. You gotta feel bad for the poor guy whose turn it was to witness a signature. There is no telling what kind of effect this stunt will have on the negotiations in the House, but you can bet it’s not going to help. Not only did you forget to mention that Josh Revak supported the act, but also forgot your frequent tendency to mention how you spearheaded a group to specifically put Revak in office. By your own definition you helped make this possible. Congratulations Jeff!